In the busy morning thinking today’s to-do list, to reach office on time and brushing faster and rinsing off. Aren’t we concentrating on brushing? “Brushing twice a day keeps the teeth clean and hygiene”, we know this from our childhood days. But are we doing it correct? Oral health impacts the overall health of the body. Tooth decay (cavities), bad breath, gum disease (gingivitis) are some of chronic disease affecting children’s to adults. Cost spending for dental care for treating problem is high and this can be preventable by routine home oral care and regular dental visit. Dental hygiene can maintain by brushing, flossing and tongue scraping, along by following a healthy lifestyle with regular dental check-ups. Oral health begins at home. We know a soft brush with fluoride toothpaste is helpful to keep germs away from teeth. 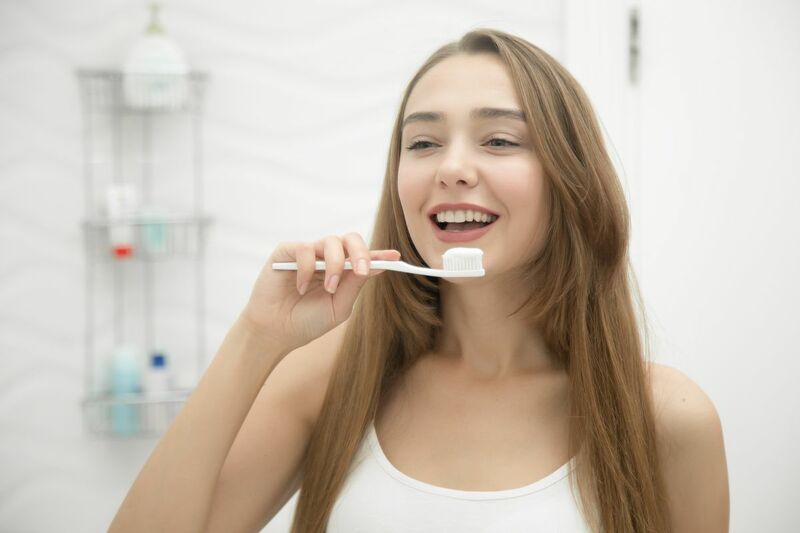 A Research says average time people spend on brushing is about 45 seconds. Is this enough to rid away the plaque which produces acid to attack the tooth enamel? No, it is. American Dental Association recommends 2 minutes of gentle brushing twice a day to remove plague. Soft, bristle and a small head brush is good for cleaning teeth. Brushing must be done gently all over the surface and sides of the teeth like round and round motion and short back and forth stroke. Too much of brushing hard may damage the teeth enamel and make teeth prone to decay. Be gentle and careful on the gumline. Place brush tip at 45-degree angle to the gum and use a gentle circular motion for cleaning gums. A strong gumline can keep your tooth healthy. Around the teeth can be cleaned by dental floss. Dental professionals recommend flossing once a day to remove food debris and bacteria which is stuck in-between each tooth. Use clean floss for cleaning every tooth. Floss up and down without hurting gums. You can do flossing before brushing preferably at every night. Brushing after flossing helps fluoride to set in the teeth which attack the plaque overnight. Always semi rinses mouth after brushing. Rinsing off completely will wash away the fluoride in the paste too, which leaves the teeth for plague attack. Bacteria in the plaque also stick to the tongue. You can use tongue scrapper to clean away the plaque built up on the tongue. Even you can also scrap the tongue using the same brush used on cleaning the teeth. Thereby cleaning the tongue, you can keep your mouth clean and increase the quality of oral hygiene. The foods we eat have major impact on the health of the teeth. Foods rich in sugar, carbohydrates, and starches are responsible for producing acid and attack the tooth enamel. These foods are best treats for bacteria and start to produce an acid attack, which slowly dissolve the tooth enamel and produce cavities in the tooth. Even some naturally available foods also contain sugar such as fruits, dates, raisins which also contribute to tooth decay. We can’t eliminate sugar from the family diet because most of the food has some form of sugar and starchy substances. However, we can control the amount of sugar intake and reduce the time of teeth exposed to the sugary substance and acid attack. Other than food intake, smoking and alcohol can also contribute to the risk of oral hygiene and other health problems. A Healthy lifestyle is important for good oral hygiene. A healthy balanced diet contributes to healthy teeth. We know food rich in calcium is best for strong teeth. A balanced diet not only contributes to oral health but also for overall health. Fruits and vegetables are rich in water and fibre which helps to balance the sugar they contain. Chewing them also produce saliva which helps to wash away the harmful acid formation in teeth. Fruits can be taken whole instead of fruit juices. When fruits are blended, sugars are released from their structure and start damaging the teeth. According to National Health Service (nhs.uk) total consumption of juice from fruits, vegetables or smoothies shouldn’t be more than 150 ml per day. It’s best to dink fruit juice or smoothies at mealtimes. You can also swap regular drinking water to tap water which is fluorinated. To stay away from teeth stains, stop smoking and limit the consumption of alcohol, tea and coffee. Help children in the family to know the essential of good dental health. A Key stats from AAPD states that tooth decay is the number one chronic infectious disease affecting children in the United States and is on the rise, but largely preventable. Parents need to help or assist in brushing children’s teeth at least they are 7 years old. Kids may find easier to use an electric brush for cleaning the teeth than the normal. There are rhymes such as “brush brush up and down, brush brush round and round” and several more app to help them brushing motion. Set the timer for 2 minutes and ensure them to brush the teeth gently. Ensure the habit of brushing two times a day. Cut down on sugary drinks in your child’s diet. Switch for healthier options like drinking plain water or no added fruit juices. Make sure to take sugary foods in one go rather than throughout the day. Continuous sipping and snacking sugary foods throughout the day results in a greater amount of time exposed to acid attack and causes tooth decay. Make a first dental appointment by your child’s first birthday. Make a regular family dental appointment for healthy dental care. Even if you have no dental problem regular dental check-up is more important for healthy teeth and gums. A dentist may find for any earlier sign of cavities and fix them. Any untreated cavities can grow larger and leave permanent damage to the tooth. Before causing a major problem it is easier to fix it in the earlier stage. At the same time, dental expenditure to treat the problem at worse condition is high compared to that of an earlier check-up. Take your child for a regular dental check-up. The dentist may advise you on how to prevent tooth decay and follow up their advice for brushing routines, diet and next dental visit. Author Bio: Esh is a Melbourne based Freelance Writer. She is interested in beauty, health, fitness, personal hygiene and writing articles on it. In the meantime, she loves cooking and enjoys walking at the seashore. You can reach her @LinkedIn.